Residents and the Stop The Wall protest signs. 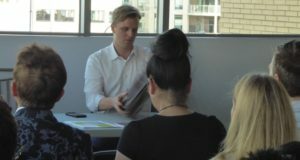 There was a full house ready to greet city councillor Joe Cressy as guest speaker of the CityPlace Residents’ Association (CPRA) second town hall of the year on May 31. 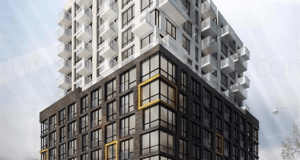 And while it was intended to be an agenda-less night designed to bring residents up-to-date on community affairs and for Cressy to answer questions from the floor, the meeting was “augmented” by members of the Queens Quay Committee and York Quay Residents’ Association. 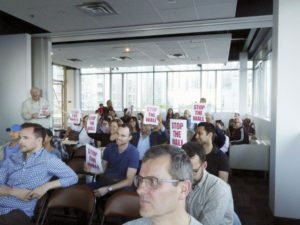 They had their own agenda—to rally more support against Coal Harbour’s new Maple Leaf Quay tower. This proposal (for a 29 storey building with a linear east-west articulation) would essentially fill in the space between the two existing Maple Leaf Quay buildings located at 350 and 390 Queens Quay. Moving back to CityPlace itself, Cressy brought residents up to date on the status of Block 31, the area adjacent to Brunel Court which has been designated as the future location of two schools (one each from the Toronto District School Board school and the Toronto Catholic District School Board) and a community centre. A request for proposal was launched earlier this year; now that a developer is on board (and an extra $8M has been secured secured) work will be started this summer. If all goes to plan, residents can look forward to a fall 2019 “Back to School” opening date. Described by Cressy as being “state of the art facility for a vertical community,” the community centre will host a gym, dance studios and indoor play facilities, while the rooftop will feature a basketball court, a running track and a green roof. The councillor also indicated that the community centre could well be a hub for other community activities and programming such as a year-round market for food and artisan wares as well as workshops. Councillor Joe Cressy, notebook at the ready. 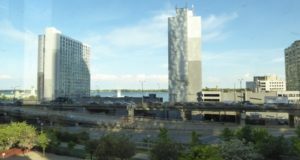 The two current Maple Leaf Quay buildings and “the space” which will disappear with the new proposal. Queen’s Quay Committee member, Robert Nordness. Dean Maher responds to the dog issue. 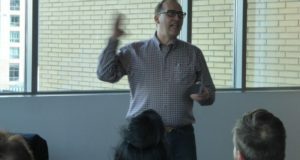 As a passionate advocate for parks—and the proposed 8.5 hectare Rail Deck in particular—Cressy also mentioned that the agenda for the Toronto and East York community council meeting on June 13 includes a staff report that proposes to declare the air above the Rail Deck site a “park.” This tactic would essentially knock out Craft Development Corp.’s plan of lining the site with high-rise condos, offices and retail. There is, however, more immediate relief in sight for CPRA park lovers. Cressy indicated that the stalled 1.5-acre Mouth of the Creek park located on the north side of the Fort York Library has been fully funded and construction will start next year. Is there any residents’ association meeting that doesn’t mention dogs, traffic congestion, and parking? All came up at the meeting. One dog-owning resident mentioned the inadequacy of the current off-leash dog run on Canoe Landing—its pocket-handkerchief size and lack of shade being specifically mentioned—and Cressy responded by agreeing about its inadequacy and saying that a second dog run was already being considered. He also added that—while still a few years away—a dog run is being considered for the Bentway linear park running from Strachan to Spadina under the Gardiner. Speaking on behalf of dog and their owners, long-time resident Dean Maher indicated that a sub-committee would be exploring ways to better serve dog owners and their 4-legged charges. On traffic: the councillor indicated that most Downtown dwellers walk, bike or use transit. He noted that the TTC 121 Fort-York Esplanade bus is now permanent. Cressy also observed that while the opening up the green median on Fort York Boulevard to additional cars could be a possible short-term solution to the area’s congestion, the median itself is reserved for the future construction of a light-rail transit track. That future LRT would originate at Union Station and is proposed to continue west through the Fort York neighbourhood. More information about this LRT project will be released in the coming year as will information about the new GO station planned for Spadina and Front. With memories of last year’s blackouts still fresh in mind, a resident questioned the councillor about the resilience Downtown power infrastructure. In response Cressy referenced Toronto Hydro’s new underground Clare R. Copeland transformer station which is in the final stages of construction (located near to CityPlace adjacent to the landmark Roundhouse building). Cressy expressed confidence that power outages caused by infrastructure failings (as opposed to weather-related outages) would be a thing of the past. CPRA president Gary Pieters concluded the meeting by thanking all who attended and indicated it was their commitment to the community that helped keep it vibrant. 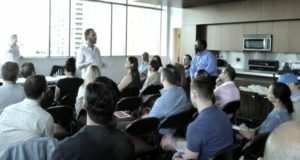 He also mentioned two CityPlace programming events taking place this summer: the monthly Saturday night movie nights (starting June 17 and running through Sept. 16) and the urban market every Saturday from 10 a.m. to 6 p.m. at Spadina and Bremner by Concord.